Always Good. Always Hood. Sweepstakes: Are You Today's Winner? Hood is helping you find the perfect recipe for you, no matter what the time of day. 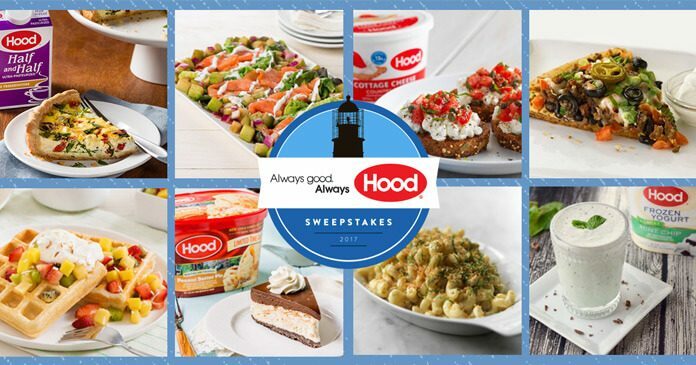 Visit alwaysgoodalwayshood.com and play the Recipe Clock game to find out if you’re today’s instant winner during the Always Good. Always Hood. Sweepstakes. The Sweepstakes is open to legal U.S. residents who are 18 years of age or older at the time of Sweepstakes entry, and who reside in one of the following states: Connecticut, Massachusetts, Maine, New Hampshire, Rhode Island or Vermont. Each entrant must have a unique, valid email address. The Sweepstakes begins on September 6, 2017 at 9:00 am ET and ends on September 27, 2017 at 8:59 am ET. Entrants may enter one time per Daily Term and up to 21 times during the Sweepstakes Term. The winner of each Daily Prize will be randomly determined using an online randomizer program. The randomizer program will generate a winning time on the Recipe Clock. If you are the first entrant that Daily Term to choose the randomly-selected Recipe Clock time when you play the Recipe Clock, you will be the potential Daily Prize Winner. For the Grand Prize Drawing, Sponsor randomly will select the potential Grand Prize winner in a drawing of all eligible entries received by Sponsor during the Sweepstakes Term. One (1) $800.00 Union Bluff Hotel Gift Card for use toward lodging and on-property dining. One (1) $100.00 Liquid Dreams Surf Shop. One (1) $100.00 Visa Gift Card. For a list of Sweepstakes Winners, send a written request together with a self-addressed, stamped envelope to Always Good. Always Hood. Summer Sweepstakes, c/o HP Hood LLC, Six Kimball Lane, Lynnfield, MA 01940. Requests must be received within 90 days after the end of the Sweepstakes Term. Vermont residents may omit return postage. HP Hood LLC, Six Kimball Lane, Lynnfield, MA 01940 is the Sponsor of this Sweepstakes.